"I have never been anywhere where the music is as much a part of life as it is here. It's like the air you breathe." At the turn of the century, Christian missionaries and teachers who penetrated the then-unknown territories of Appalachia made an astonishing discovery�that the native ballads, "love songs" as the locals called them, were in fact variants of Scots and Irish folksongs, passed down from their ancestors who had emigrated to the area, in some cases more than 150 years earlier. 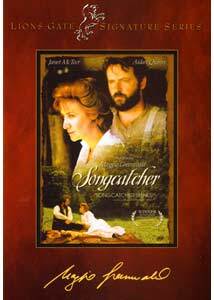 Director Maggie Greenwald draws on historical fact to examine one woman's discovery, not only of the music, but of herself, in Songcatcher. Dr. Lily Penleric (the wonderful Janet McTeer), a musicologist recently passed over once again for a promotion to full professorship, travels to the backwoods of North Carolina to spend some time with her sister Elna (Janet Adams), who teaches at a small settlement school. She soon realizes that documenting and publishing the musical treasure trove that she has discovered is the key to her professional advancement, and begins to strike up relations with the locals, some of them proud to share their musical heritage, and others who see her as nothing more than a thief and exploiter. Primary among the latter is Tom Bledsoe (Aidan Quinn), one of the few locals who has "gone to the other world", then returned. The first half of this film is a joy, and much of that enjoyment comes from the interaction between the locals and the stuffy, yet forthright Dr. Penleric, as she learns to deal with an environment and people that are completely foreign to her. She is never portrayed condescending, but rather as a fish out of water, as she first alienates, then ingratiates herself to the local populace. The locals are portrayed sensitively, more as uneducated than stupid—proud, with a necessary self-sufficience that the "outlander" Dr. Penleric grows first to respect, and finally to understand. But eventually, director Maggie Greenwald succumbs to the near-inevitable temptation of melodrama, and what started as a lovely, lyrical film becomes a succession of unmotivated (and unnecessary) plot devices, the most unbelievable among them the complete about-face in the relationship between Lily and Tom. A bizarre subplot involving "the love that not dare speak its name" becomes the motivation for the destruction of the school, and this turn of events curiously drives the narrative to its foregone (and unsatisfying) conclusion. Since Greenwald not only directed, but also wrote the script, it's hard to see this as anything less than a conscious choice on her part, and it's not entirely surprising that her efforts since Songcatcher have been in television, which seems a medium more suited to the melodramatic plot devices that she apparently favors. But compensating for the misguided plot are two factors that keep the film enjoyable throughout: first, the beautiful cinematography by Enrique Chediak, which faithfully translates the lush Appalachian settings to the screen; and second, the wonderful music. The simplicity, austere beauty, near atonality, and stark emotion of many of the ballads provides a necessary tonic to an overblown narrative that would otherwise sink the film. Image Transfer Review: It's curious that Artisan would choose to release a transfer at 1.78:1 (and mention it on the packaging), rather than the standard 1.85:1, since most viewers would never know the difference, due to overscan. Even if it is slightly cropped, this is a great transfer�Artisan has outdone themselves. The beautiful Appalachian settings come through clearly, which is especially impressive given that greens are the most difficult colors to reproduce accurately with NTSC. Skin tones are always spot-on, and their subtle variations resulting from various lighting schemes are striking. Audio Transfer Review: This is a curious, yet apparently accurate, audio transfer of the film. The audio is at all times clear, with quite a dynamic range, and yet there is little activity in the subwoofer, and almost none in the surrounds. However, there is one scene, of Lily being chased by a possibly mythic panther, where the animal's shrieks echo from the fronts to the surrounds, so apparently the flatness of the soundstage was a deliberate choice, rather than a fault of the transfer. Extras Review: The packaging lists a featurette, but it is AWOL. The three extended scenes are a bit of a disappointment�they are nothing more than slightly lengthened versions of three of the musical numbers featured in the film, minus the cutaways to whomever is listening. The interviews are slightly better, although most are under a minute, and leave one wanting more�especially the interview with David Mansfield (director Maggie Greenwald's husband), who speaks about the historical background of the film. The strangest interview is with Dolly Parton, who talks about writing an original song for the film, although her name isn't mentioned in the credits, and her distinctive voice is nowhere evident on the soundtrack�but if you tire of listening to Emmylou Harris' dull, over-sanitized rendition of Barbara Allan over the end credits, switch your audio to "Music Track Only", where you'll be able to hear Parton's song. Or buy the Music from and Inspired By soundtrack. If you have an endless interest in the music and musicians that provided the inspiration for the film, you'll enjoy the commentary by Maggie Greenwald and husband/composer David Mansfield. Greenwald also describes the actors and other incidental details of the making of the film, but the intermittent commentary soon wears out its welcome, and it is telling that any analysis of the narrative traps that Greenwald sets for herself, and the difficulties they engender, is absent. What starts out as a lyrical portrait of an outsider's discovery of Appalachia's musical heritage in the end succumbs to unnecessary conflict and melodrama. But the music and cinematography are outstanding, and the wonderful transfer adds greatly to the enjoyment of watching this film.